in the body. Acupuncture has its roots deeply planted in China. In fact, authorities agree the science is between 5,000 and 7,000 years old. Its use spread throughout ancient Egypt, the Middle East, the Roman Empire and later into Western Europe as merchants and missionaries to China told of the amazing discoveries the people of the Orient had developed. Acupuncture did not become known on a national level in North America until 1971 when diplomatic relations between China mid America were relaxed. the combined total of all other holing sciences, both ancient and modern." Far too often in the medical professions, a patient is told after extensive examination, "There is nothing wrong," It is all in your "head," or "Sorry, you'll have to learn to live with it." The examining doctor unable to find the cause of the problem has little else to tell the patient. Fortunately, many physicians are now referring their patients for an acupuncture evaluation as a last resort. The human body's energy flow courses over twelve meridians or channels flowing through the body that are normally well balanced. Oriental Medical experts say that pain and disease are caused by either an imbalance or a blockage of the energy circulating in the body. Acupuncture restores the proper flow of energy, returning the body to good health. Acupuncture is a principle, not a technique. The principle of acupuncture does not change, only the technique. 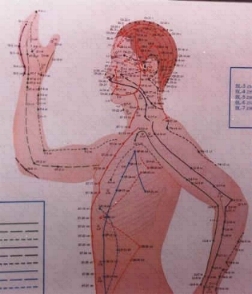 Acupuncture's goal is to restore normalcy to the body's energy balance by utilizing a combination of 'Acupoints' located on the twelve meridians channels. 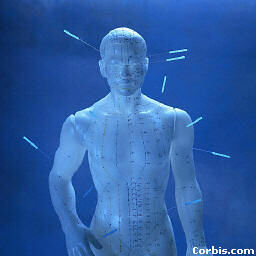 In an acupuncture treatment, thin sterile needles are inserted at specific points on the body. These points are carefully selected by the Licensed Acupuncturist according to the patient's problem. Each treatment is tailored to the individual's needs. 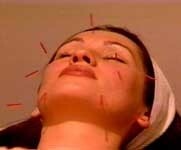 The acupuncture treatment corrects the imbalances, removes the blockages of energy and restores health. "Meridian" therapy is the accepted name employed by those who practice the principle of acupuncture without the use of a penetrating needle. Even though needles are perhaps the highest form of acupuncture, the non-piercing methods run a very close second and in some cases, equal response to the needle. acupuncture, is a device that is simply struck on the patient's skin with 20-25 light tapping strokes that produce a mild to moderate sensation. Compare it to tapping a spring-loaded ball point pen on the skin and is and is still employed with much enthusiasm in hospitals, clinics, and institutes around the world. Thumb pressure is equally impressive and not considered painful. At Advanced Healthcare, Dr. Pisarek like many other health providers certified in Acupuncture and licensed Acupuncturists, are employing electronic and laser stimulation to the 'Acupoints' with equal effectiveness as the needle. Both of these procedures are painless and are quickly becoming standard worldwide. Laser, or more recently red light-emitting diode, has received considerable attention internationally and is being used in some of the most noticeable institutes in the People's Republic of China, as well as the majority of the Eastern bloc nations, Europe, Soviet Union, and America. One would assume inserting a needle into the skin would he painful since most of us can relate to being stuck with a pin or having a hypodermic injection. However, three to four acupuncture needles can easily be inserted into the hollow tube of a hypodermic needle. Because of the extreme slenderness of the needle, most people compare the sensations to less than a mosquito bite. Phenomena referred to as "TEHCHI" occurs when the energy is contacted. This sensation is felt as a mild to moderate heaviness or tingling. At Advanced Healthcare we prefer the use of Laser photo-biostimulation (low-level laser therapy - LLLT) over needle insertion as the session times are shorter, results are accelerated, painless and non-invasive with laser light energy. 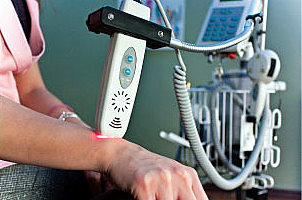 The sensation felt with the laser acupuncture probe instrument is basically that of the pressure of the probe against the skin over the Acupoint, with possibly a slight warming and/or a mild tingling being perceived.